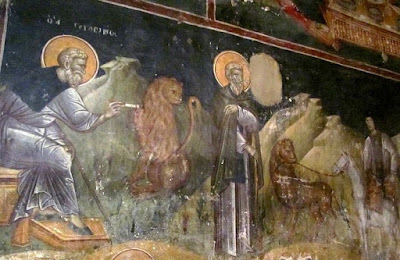 On the fourth of this month [March], we commemorate our Holy Father Gerasimos of Jordan. Having killed the beast of the passions before the end of his life. 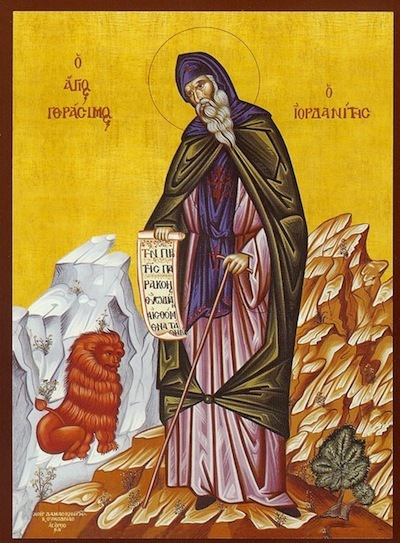 Venerable Gerasimos lived during the reign of Emperor Constantine, who was nicknamed Pogonatos (668-685),* as Sophronios of Jerusalem, who wrote his life, attests. Since childhood he had fear of God and, after he was dressed in the schema of a Monk, he went to the deepest parts of the desert of the Thebaid. ** He reached such a height of virtue and was graced with such intimacy with God, because he had preserved His image and likeness so pure, that he even had authority over wild beasts. A lion used to attend to his needs, and among other things this lion used to graze the donkey which fetched water for the Saint. Once some merchants passed from that place. When they saw the donkey, they stole it. The lion was sleeping and did not sense a thing. Therefore, in the evening he returned to the Saint as usual without having the donkey with him. When the Saint's servant saw the lion alone, he told the elder that the lion had eaten the donkey. Wherefore, the poor lion was condemned to carry the pitchers on his back and fetch water from the river instead of the donkey, for as long as the merchants kept the donkey. However, the same merchants happened to pass from that place again and they had the donkey with them. As soon as the lion saw the donkey, he recognized it and rushed at the merchants with a loud roar. The people got scared and left. Together with the donkey the lion brought to Saint Gerasimos' cell the camels which were tied to it. Knocking on the door of the Saint's cell with his tail, he acted as if to show that he was offering them to the elder as game. * In fact, it was during the reign of Emperor Marcian (450-457). ** Rather, it was the desert of Jordan. *** Being a simple and innocent man, Saint Gerasimos had been deceived by Theodosios the Monophysite, as were the anchorites Peter, Mark, Jullon and Silvanos, into accepting that Christ only had a divine nature. When he went to visit Saint Euthymios in Rouba, and as they were discussing the faith, Euthymios discovered that he had been deceived. Euthymios instructed Gerasimos, and so he rejected this false doctrine and bitterly lamented his error. The above named anchorites were also delivered from error by Saint Euthymios. Thou didst prove to be a citizen of the desert, an angel in the flesh, and a wonderworker, O Gerasimos, our God-bearing Father. By fasting, vigil, and prayer thou didst obtain heavenly gifts, and thou healest the sick and the souls of them that have recourse to thee with faith. Glory to Him that hath given thee strength. Glory to him that hath crowned thee. Glory to Him that worketh healings for all through thee. 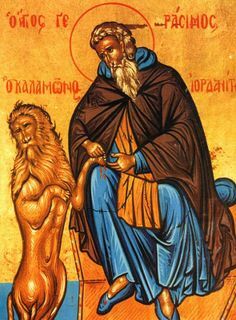 As a star resplendent with the light of virtues, thou didst make the wilderness of Jordan radiantly shine with beams of sacred celestial light, O Venerable Father, God-bearing Gerasimos. Aflame with heavenly love thou didst prefer the desert's hardship to all the pleasures of the world. Wherefore a wild creature served thee and became obedient till death. God glorified thee with signs and miracles: in thy prayers remember us also, O God-bearing Father Gerasimos.